PyeongChang, South Korea – Vermont’s Kelly Clark and Scotty James of Australia picked up the wins at the 2016-17 season’s final halfpipe Snowboard World Cup event, which took place on Sunday at the Bokwang Phoenix Park Resort in South Korea. 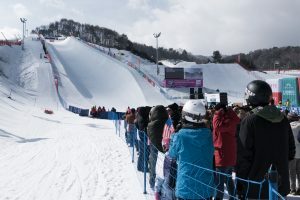 The competition also served as the official test event for the 2018 PyeongChang Olympic Winter Games. 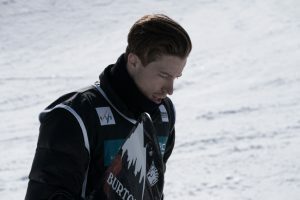 While James, who had triumphed in the X Games earlier this season, walked away with his career’s second Crystal Globe since 2014, America’s Chloe Kim clinched the title for the women. 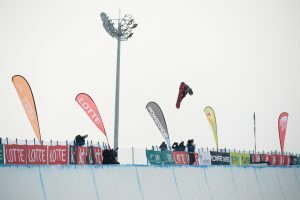 It was Kim’s first even though the teenage halfpipe sensation from California finished in fourth place on Sunday. Fresh off a win at Mammoth Mountain, Clark scored 94.00 on Sunday to hold off Chinese shredders Jiayu Liu (91.50) and Xuetong Cai (86.50). It was not only Clark’s 13th win on the World Cup tour, but also her fourth consecutive triumph in an official Olympic test event World Cup after prevailing in Bardonecchia (ITA) in 2005, Cypress Mountain (CAN) 2009 and Sochi (RUS) back in 2013. Over in the men’s event, reigning world champion Scotty James added another big win to his resumé, earning the highest score of the day of 96.00 in his third run to put pressure on U.S. superstar Shaun White. White, however, couldn’t step up his game and had to settle for second place, thanks to his first-run score of 95.00. China’s Yiwei Zhang, the first rider who had stomped a triple cork in the pipe, rounded out the podium in third with a 93.25. With the season’s last halfpipe World Cup in the books, the finale of the snowboard freestyle overall World Cup tour is slated to take place in Spindleruv Mlyn, Czech Republic, where a slopestyle competition will wrap things up March 24-25. That will be followed by the 12th FIS Snowboard World Championships in Sierra Nevada, Spain, March 7-19.